This spreading groundcover gets rave reviews from gardeners for its brilliant flowers and for its tolerance of heat, drought, cold, and poor soils. Warley Rose Rockrose will dazzle you with bright pink, crepe-paperlike flowers with golden, fuzz-ball centers that adorn its deep green, crinkled foliage. This low, mounded, evergreen shrub is named for its preferred native habitat of rocky, relatively poor soil on scrubby hillsides in Mediterranean Europe, and is perfect for sunny, dry, hot situations. Like all rockroses, it is a very drought resistant, sturdy plant that requires little maintenance, shuns fertilizer, and doesn’t like too much summer water. Prune lightly to shape after flowering, but don’t cut into wood, as it may not resprout. 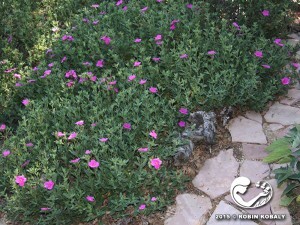 Warley Rose Rockrose thrives in full sun and well-draining soil, and is a great groundcover, border edging, or rock garden plant. Works well in containers. As a bank cover, this spreading plant helps control erosion. 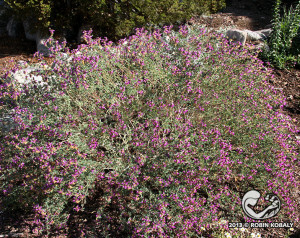 This lush desert groundcover is surprisingly drought-tolerant due to its deep roots. It’s large, beautiful flowers attract pollinators all night, then say goodbye each day with a fading pink farewell. 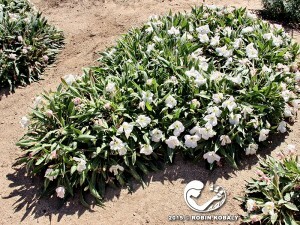 White Evening Primrose creates masses of fragrant, four-inch wide, snow-white flowers each evening that attract night-flying pollinators like hawk moths. Throughout the next day, we can enjoy each one-day flower that opened at dusk as it ages from white to pink before closing in the heat of day. Plants form a rosette of large, fuzzy, dark-green leaves. While short lived (usually three years), this plant is fast-growing, and easily reseeds. Replace when plants begin to decline or die out. White Evening Primrose requires excellent soil drainage and a little supplemental water in summer, but too much summer water will kill it. Trim off dead leaves and seedpods. This southwest beauty makes a delightful border flower in small spaces, entryways, and patios, and offers a colorful accent in rock gardens. Bulbine is becoming more and more popular due to its drought resistance, fast growth, tolerance of poor soils, and repeated blooms of cheerful flowers that are yellow or orange, depending on the variety. 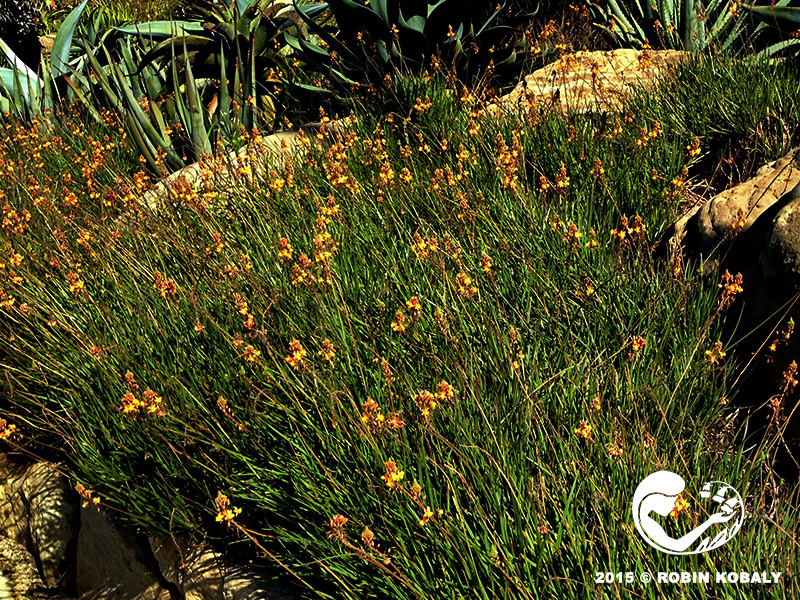 Bulbine is a clumping, succulent groundcover that spreads by underground stems called rhizomes. Its thick, fleshy leaves equip it to withstand long periods of drought. Yellow or orange flowers on 12 to18-inch stalks hover over the mass of leaves in late fall to spring (in yellow-flowered plants), or spring through summer (in orange-flowered ‘Hallmark’ & ‘Tiny Tangerine’ cultivars). Each star-shaped flower flaunts a ball of fuzzy filaments in its center. Deadhead flowers to encourage continual bloom. This fast-growing perennial fills out quickly, and can be propagated from cuttings to fill in aging portions. After extended frosts, new leaves will quickly replace damaged foliage in spring. Bulbine is best planted in masses and in rock & cactus gardens. It is great in containers that can be moved during hard frosts. Copper Canyon Daisy is an aromatic, long-blooming relative of marigolds whose long-lasting flowers shine throughout winter months and attract butterflies. Copper Canyon Daisy is highly aromatic, releasing a strong fragrance when its foliage is rubbed or brushed against, which is likely the reason that rabbits and deer leave this plant alone. 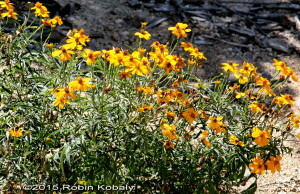 Yellow-orange, daisy-like flowers develop in fall, and provide intense color through late fall, winter, and into early spring, if not damaged by frost. Lacy, dark green foliage is tipped with fragrant oil glands, which release a scent reminiscent of typical marigolds. Cut plant back hard in late winter or spring after blooming subsides to remove any frost-damaged foliage, to promote dense growth, and to keep it a nice shape. This drought-tolerant plant appreciates a little irrigation, but too much water or too little light can produce leggy plants with sparse flowers. 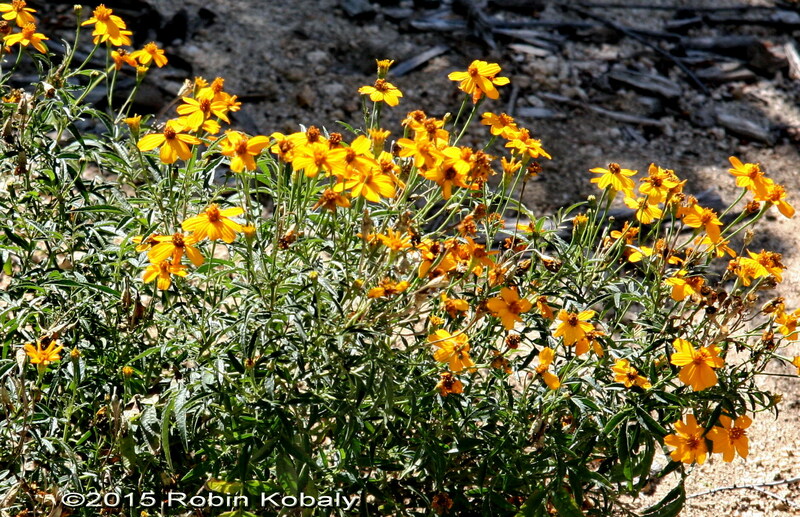 Plant Copper Canyon Daisy back from high traffic areas, due to its brittle stems. While not long-lived, this fast-growing plant works well in the background to set off shorter plants in front. 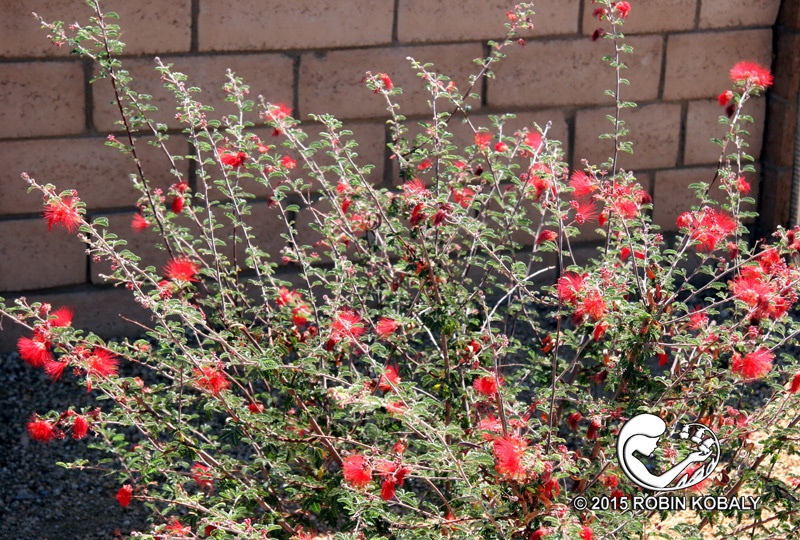 Bring color and hummingbirds into your yard with Red Fairy Duster, a long-blooming, lacy-leaved evergreen shrub. Red or Baja Fairy Duster produces exotic, feather duster-like flowers made up of clusters of deep red stamens that hummingbirds can’t resist. In fact, hummingbirds are extremely territorial of Fairy Dusters to protect their year-round nectar. Its criss-crossing branches are clothed with feathery leaflets that resemble miniature ferns, and which fold closed each night. Its seed pods look like brown snow peas. Fairy Dusters are evergreen if given light water weekly or deep water once a month in dry seasons (they drop their leaves if drought- or cold-stressed). 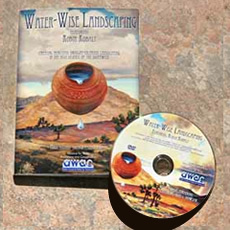 Excessive water promotes leggy growth, yellow leaves, and reduces flower display. Flowers can appear almost continually, but heaviest bloom occurs in spring and fall. Some twig damage may occur below 20°F; prune back after frost in late spring. Red Fairy Duster is great as an accent, in borders, or massed as groundcovers. Their fine-textured foliage sets off more robust plants like cacti and succulents. Prized as one of our few fall-blooming groundcovers, Black Dalea’s blanket of purple flowers from late summer to fall attracts butterflies, quail, and bees to the feast. Black Dalea is a rare fall-blooming groundcover blanketed from late-summer to fall with purple flowers that attract butterflies and quail to your garden. Its fine-textured foliage of tiny leaflets contrasts nicely with cacti, yuccas, and succulents. 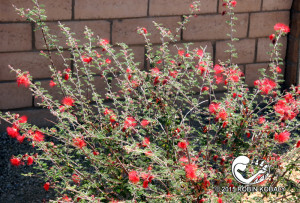 This extremely drought-tolerant, fairly fast-growing shrub requires little or no maintenance. Black Dalea resents fertilizer and overwatering, which promote weak growth; it can tolerate light, filtered shade, but may get leggy with too much shade. Since it drops most of its leaves during its winter dormancy, place it near evergreens or succulents to avoid an obvious “hole” in your winter landscape. Shear it fairly hard in late winter to rejuvenate the plant. Pollinators, including bees, love the flowers, so avoid planting close to areas where people gather. Excellent for erosion control on slopes, as a low-maintenance groundcover, an accent plant, and where reflected heat may be too much for other plants.